Hi Gary I recently purchased the 9106 Salter Body Analyser and Scale. The instruction manual was received, however could you please clarify the following so I can interpret the Bone Mass feature and the Muscle Mass feature (the manual seems to dwell on the body fat percentage and body water percentage withe tables). These are difficult questions to answer because we are all the same but also a little different. 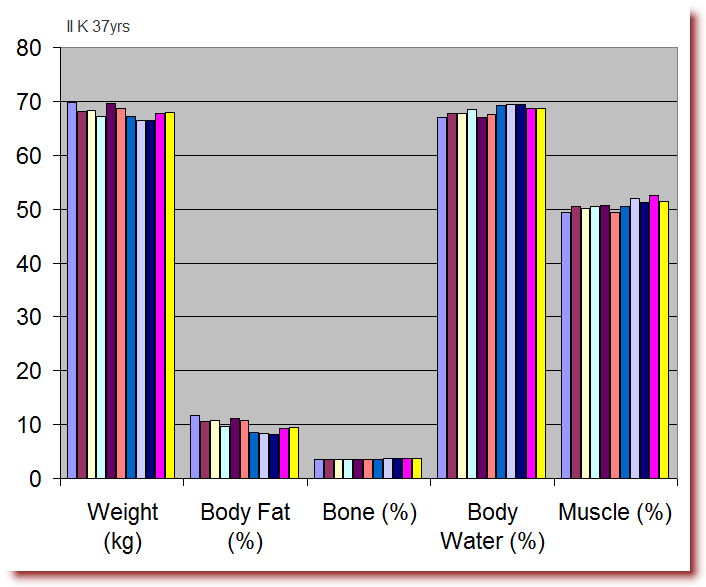 Also, with age we tend to lose muscle, bone and water while fat increases as a proportion of total weight. There are also ethnic differences. So, it is better to talk in generalities and not be too hard and fast about what are ideals. I am even a little reluctant to talk about "ranges". It is very simple to set up and use in the privacy of one's own home. It is remarkably accurate: The only thing that varies from one reading to another is the person being tested. Whereas when using devices like calipers, the person conducting the test is the greatest variable. It is available in most countries, or can be shipped internationally, so I can have people take their readings no matter where they live and email me a spreadsheet of their results. By having everybody using the exact same machine, we have consistency in results which makes my job much easier when giving advice and guidance. It is inexpensive while being every bit as accurate as much more expensive machines. The 9106 Salter Body Analyser and Scale retails for about NZ$140-160 but can be purchased off me for much less. This is because I want my clients to have the same machine so that we have consistency in readings. How does BIA (bioelectical impedence analysis) work? Read this Wikipedia page for more. 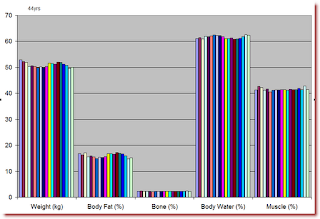 BIA, using the 9106 Salter Body Analyser and Scale is very accurate when repeated on the same person. If other makes and models of machines are used then there will be confusing variations in readings due to the lack of industry standards. So, when using BIA it is essential that readings are all done on the same machine. In this case the 9106. I do not generally like to compare one person's readings with another person's. It is preferential only to compare one person's multiple readings spread over a long period of time, with little reference to comparisons with other people's readings. What really counts is any changes that happen in a person's readings over time - not in comparison with anybody else. I never use the "sedentary mode" on these scales. Always use the "athlete mode" regardless of current or historic activity levels so as to avoid any confusing results, should you decide to switch to athlete mode later on because your client has taken up an exercise programme. Assume that everybody being tested is going to be active, if not immediately, then some time later. If you switch between active and sedentary, you will not be able to compare before and after readings. People usually want to reduce their body fat percent, increase hydration, increase lean mass and increase bone mass. Lean mass will change very slowly over several months. Changes in bone may take years to alter, but is possible. There are cases where a person needs to increase their fat percentage, such as a thin woman wishing to get pregnant. As a general rule of thumb, she should have a body fat percent of no less than 15% and preferably greater than 20% but not higher than 30%. This healthy fat percent sends positive signals to the ovaries that now is a good time to bear a child. A healthy sedentary woman will be between 20 and 30 percent fatness while a male will be between 15-25%. It is not uncommon to find men with an excess of 40% fat and women exceeding 50%. Such high levels are clearly unhealthy and more common than not. Using the 9106 Salter Body Analyser and Scale is most helpful when monitoring weight loss. The key to healthy weight loss, in the majority of cases, is to reduce fat while increasing or maintaining hydration, muscle and bone mass. This is best achieved with moderate exercise and a healthy wholefoods diet than with severe calorie restriction and boot-camp-style exercise thrashings. Focusing on weight loss alone, without regard to retaining lean mass may not be healthy and may be unsustainable over the long term: As lean mass is lost, along with fat, the risk is that metabolism declines (energy is required to maintain lean muscle mass, so less muscle = less base metabolic needs). In this case, fat will go on as soon as the effort to restrict calorie and to participate in unpleasant exercise weakens, as it will. The usual result is the person ends up getting even fatter due to the lowered metabolism associated with the loss of lean muscle that is not recovered as the calories come back in. A healthy and very fit female athlete will be from 15-20% fat and a male 10-15%. If a female drops below 10% fat she risks her periods stopping and the gradual loss of bone mass leading to stress fractures, chronic fatigue and other health issues. If a male drops below about 8%, he also risks similar health and injury issues. 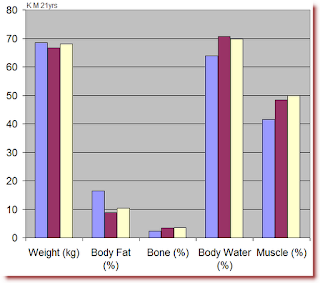 Bone mass is not measured by the 9106 Salter Body Analyser and Scale as a percentage of body mass, but as total kilograms. Bone readings are typically 1.5 to 2.5 Kg in a healthy female. In the male the range is typically from 2.0 to 3.5 Kg. I have never had a reading higher than 3.7 Kg. Bone mass is typically higher the larger the person; but this is not the absolute rule. 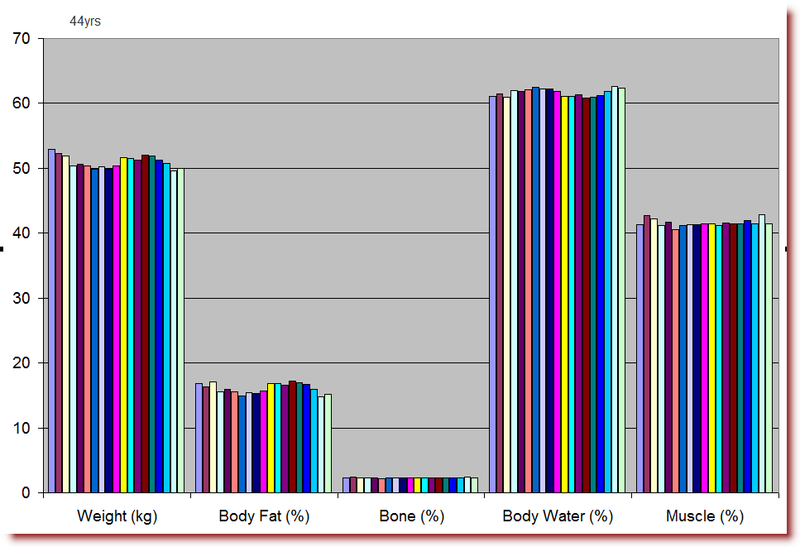 I have had readings as low as 2 Kg bone in males weighing as much as 130 Kg. This is because there are a number of factors, other than size, that determines bone mass, including the nutrient density of their food, exercise levels, sunlight (vitamin D) and exposure to environmental toxins such as lead (Common in men who work with their hands). Because bone mass should never vary over anything less than several months, if not years, use the bone mass readings as a means of ensuring that your 9106 Salter Body Analyser and Scale is working properly: If a subject has readings of, say, 1.9 Kg bone, this should not vary more than about 100 grams between successive readings. If there is a discrepancy greater than 100 grams between readings, then question the accuracy of that reading. Hydration is an interesting one. There is no relationship between hydration levels and how much a person drinks daily. I am wrong to say that: There is an inverse relationship: People who drink the most water (mostly young women) tend to be clustered at the low hydration end! Please read my article here about this issue of drinking and hydration. Is this not a case of "Brain-washing" by the water bottling industry? (Hyponatremia - in medical jargon). Water will only be retained in the cells if there is sufficient and balanced minerals in the cell, including sodium. If there are insufficient minerals, or imbalance, the cells will not take up the water and it will be dumped via the kidneys. Some minerals are inevitably lost with the excess urine. So, my advice is to drink only sufficient water to replace what is lost daily while ensuring the diet is rich in minerals. Pink Himalayan sea salt is a rich source of over 80 different minerals, including sodium. You can use any scale, including the 9106 Salter Body Analyser and Scale to measure water requirements during exercise. So, weigh immediately before exercise in minimal dry clothing, then weigh immediately after with minimal clothing that is dry and compare. If, say, 500ml of water was consumed during the exercise and weight loss is one Kg, then another liter of water needs to be drunk over the next hour to fully replenish fluid loss - Make that nearer1.5 liters just to be a little on the positive side. 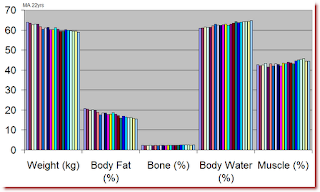 Another factor, when interpreting measures of water as a proportion of body mass, is a person's percent body fat. Fat tissue contains very little water, so as a person gains fat, his/her percent water will decline. 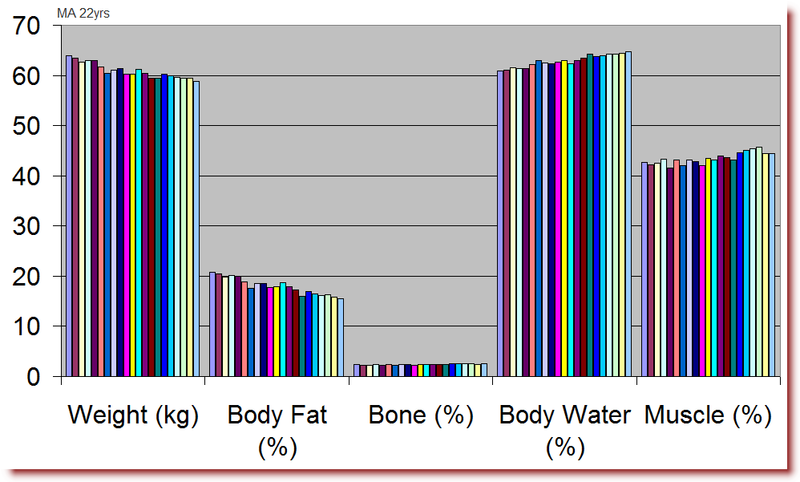 As fat is lost, percent water tends to go up. 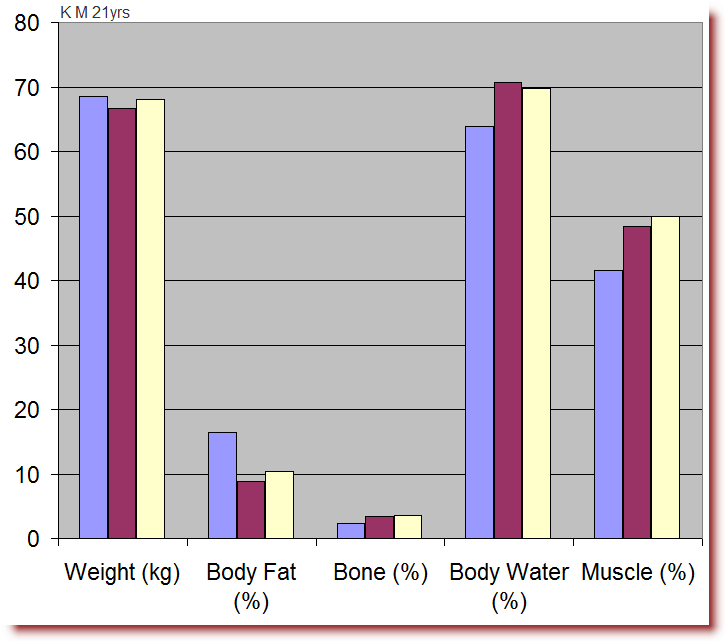 Muscle mass in a fit, healthy female will vary from about 35% to the low 40's. It is quite rare to have a male with more than about 46% muscle. 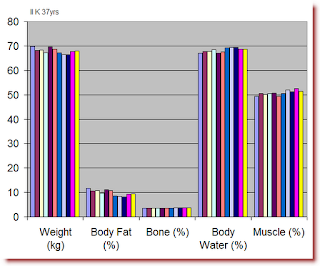 One point of note when dealing with athletes: If you are dealing with athletes, such as kayakers, who work mostly their upper body and not so much their legs, then you may get readings that have body fat slightly higher and slightly lower lean mass than expected. You will get slightly lower body fat and slightly higher lean with athletes such as runners and cyclists. Just be aware of this when interpreting readings for specialist athletes. As a person works to improve their health and general physical condition, we would expect to see a gradual decline in fat percent, and an increase in water and muscle. Bone, in kilograms, should not change from one month to another. However, you may see a pleasing gain of about 100g over several months if the diet and exercise regime is having a positive effect on bone strength and if other factors, such as the presence of lead in the bones, is being addressed. From about the 3rd decade of life, these measures of good health (high lean muscle, low fat, high hydration and plenty of bone) gradually decline in the ageing population. It is possible to reverse all of these measures of advancing age - even in subjects of advanced age. Please post your questions as comments below this article and I will do my best to answer them, thanks.